Yes ladies and gentlemen, she has finally gone off the deep end. It was not easy to work Snow White's signaiture BRIGHT YELLOW DRESS into a SITH design. What was I thinking when I started this? The blues and reds were easy to work, but that mustard yellow ...great googly moogly. After many attempts of different color palettes, I finally decided to pull back the yellow and replace it with colors from the Evil Queen. The pattern on the front flap is taken from the box the queen hands to the huntsman to put White's heart in. I think I'm okay with it ... for now ... but let me know what you guys think! I like it, but I admit I thought it was the Evil Queen until I looked at the enlarged version primary due to the color scheme. This is awesome! A nice change from Snow's normal look! Love it! Love ALL of your work! Keep it coming! I would LOVE to cosplay this. May I have your permission to? I'd also like to get a group going. 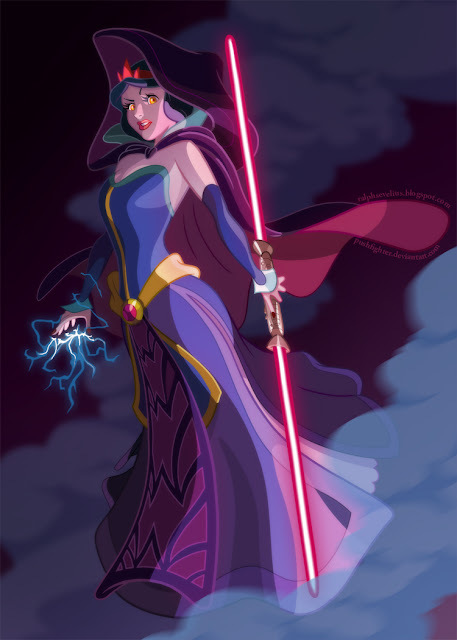 Disney Sith Princesses just sounds way to cool to pass up ! How would you feel about me getting this artwork done as a tattoo? Wow I would be very flattered! If you do get this done I would love to see the results! Where do you think about getting it? I think I want to cosplay this. It's fantastic! This is amazing! Please tell me you are going to make some more! Your work is really wonderful. Thank you or sharing your talent with the world. Best of luck and success to you! You have to get Disney to do something with this. They own the rights to Star Wars. Looks beyond Great. I love your series; I've seen them on deviantart. The only thing about Snow White that I'm not keen about is her crown. Have you tried it with her signature bow? Please do all the other Disney princesses (yep, ALL of them!). do you have facebook or subscribe or something? i want to keep updated if u add more starwars disney princess design.. Sorry man, I'm one of the few internet lepers that down have Facebook. But you can always subscribe to my this blog! I love it! Dark Snow White jedi! I love Snow White as Sith Lord! I would like to have a picture of myself as a Disney Villain to use as a cover for my demo. I'm a voice actor and I've just been invited to tour Pixar and bring my demo. I wanted to make it stand out, but I have no idea how much it would cost for an original artwork such as I've requested. Do you bother with projects such as this, or could you recommend someone who might? i like that really!awesome ! This is really fantastic! Snow White was always my favorite growing up, and it's awesome to see her as a villain, because villains hold a special place in my heart (Maleficent, the Evil Queen, and Bellatrix Lestrange to name a few). Wow, i saw this and i just think it's amazing. I can't wait to see more.